Home / AlcoPro Blog / Bath Salts: What do we really know? 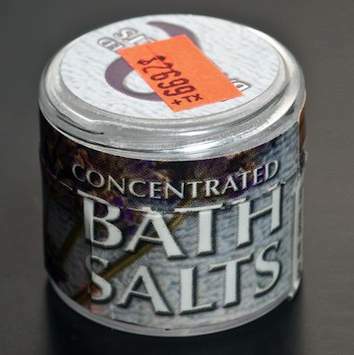 The recent emergence of this dangerous family of man-made drugs, along with other designer drugs such as synthetic marijuana, K2, and Spice, has led to a lot of confusion as to just what Bath Salts actually are, or are not. “Bath Salts” are chemicals synthetically derived from cathinone, a Schedule-I drug, which is found naturally occurring in the khat plant. Mephedrone, Methylone, and MDPV are the three most common synthetic cathinones found in “bath salts” products. These chemicals are normally a fine white, off-white, or slightly yellow-colored powder and can be found in tablet and capsule form. “Bath Salts” are usually ingested by sniffing/snorting, but can also be taken orally, smoked, or put into solution and injected intravenously. These synthetic drugs are being sold over the Internet, in convenience stores, and in “head shops”, and can often be identified by the following common street names: Bliss, Blue Silk, Cloud Nine, Drone, Energy-1, Ivory Wave, Lunar Wave, Meow Meow, Ocean Burst, Pure Ivory, Purple Wave, Red Dove, Snow Leopard, Stardust, Vanilla Sky, White Dove, White Knight, and White Lightening. Cathinone derivatives act as central nervous system stimulants causing rapid heart rate, chest pains, nose bleeds, sweating, nausea, and vomiting. Mental/Psychological affects reported include agitation, insomnia, irritability, dizziness, depression, paranoia, delusions, suicidal thoughts, seizures, panic attacks, impaired perception of reality, reduced motor control, and decreased ability to think clearly. Synthetic cathinones were temporarily added to the Schedule-I list in October 2011. Subsequently, new variations are being synthesized and are beginning to replace the most commonly found types of “bath salts” made from MDPV, for example. This indicates that the illegal production of these chemicals is sophisticated and dynamic, and will continue to be difficult for law enforcement to stop. For these same reasons, testing for and administering treatment to users of “bath salts” will also present ongoing challenges. The sweat patch consists of an absorbent pad held in place by a semi-permeable adhesive film. There are no reagents, enzymes, or chemicals in the pad, so there is no expiration date for the patches.